I moved to France about two years ago to work for Airbus in its Blagnac offices. Blagnac is a small village close to Toulouse. The place radiates passion for aviation (I once shared the geek outlook of my dentist’s waiting room). My office is located at the avenue Didier Daurat, to get there I cross two roundabouts: Maurice Bellonte and Émile Dewoitine… these names probably do not ring a bell to most of you. Neither did to me. But then the back street is called Charles Lindbergh. It is then that you realize what might be going on and wonder who the previous names were. Daurat was a fighter pilot during World War I, distinguishing himself by spotting the Paris Gun which was pounding Paris. 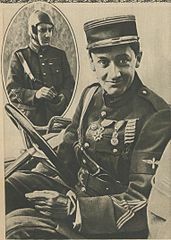 After the war, he joined Latécoère’s airline company, (which later became the Compagnie générale aéropostale – Aéropostale, then Air France) where he was a pilot and later operations director. From this time, the legend of the man with the iron will made Didier Daurat a boss admired by many, feared by all and hated by some. He did not hesitate to dismiss those who showed the slightest sign of weakness, questioned his methods or did not adhere to the ‘spirit of the mail’ (l’esprit du courrier). Dewoitine D.333 assembly (public domain image). […] Émile Dewoitine entered the aviation industry by working at Latécoère during World War I. In 1920, he founded his own company, but facing little success at home, went to Switzerland where his Dewoitine D.27 fighter was accepted for operational service. In 1931, Dewoitine went back to France and founded Société Aéronautique Française – Avions Dewoitine. During the 1930s, several noteworthy aircraft rolled out of the Toulouse-based Dewoitine factories including the Dewoitine D.500, the French Air Force’s first fully metallic, monoplane fighter, as well as the Dewoitine D.338 airliner. On 26 September 1926 he flew 4,100 km (2,546 miles) from Paris to Assuan, with René de Vitrolles, attempting at breaking a world distance record. He broke the world distance record on 28 October 1926, flying 5,396 km (3,351 miles) from Paris to Jask, Persia, with J. Rignot, as a part of 19,625-km (12,187-mile) Paris-India-Paris flight. Between 10 October 1927 and 14 April 1928 Costes and Joseph Le Brix flew 57,410 km (35,652 miles) around the world, in Breguet 19GR named Nungesser-Coli, from Paris through Argentina, Brazil, the United States, Japan, India, and Greece, although they traveled across the Pacific Ocean from San Francisco, California, to Tokyo, Japan, by ship. On 1–2 September 1930, Costes with Maurice Bellonte, flew the Breguet 19 Super Bidon “?” from Paris to New York, as the first heavier-than-air aircraft to cross the North Atlantic in the more difficult westbound direction between the North American and European mainlands. They covered either 5,850 km (3,633 miles) or 6,200 km (3,850 miles), according to different sources, in 37 hours 18 minutes. While flying over Portsmouth, New Hampshire, they lost their navigational map out of an open window of the plane. Two children saw the map falling from the sky while they were watching for the flight to cross over their farm. The children, Louise Stef and her brother John, returned the map to Costes, who had asked for its return through the media. Joseph Le Brix est d’abord un officier de marine, atteignant le grade de lieutenant de vaisseau, avant de se tourner vers l’aviation. Avec Dieudonné Costes, il réussit, sur un Breguet 19 baptisé Nungesser et Coli en l’honneur des deux aviateurs français disparus dans l’Atlantique nord à bord de l’Oiseau blanc, la traversée de l’Atlantique sud entre Saint-Louis du Sénégal et Natal (Brésil) où ils arrivent le 15 octobre 1927. Henry Potez […] was a French aircraft industrialist. He studied in the French aeronautics school Supaéro. With Marcel Dassault, he was the inventor of the Potez-Bloch propeller which after 1917, have been set on most of all Allied planes of World War I.
Alberto Santos-Dumont […] was a Brazilian aviation pioneer. The heir of a wealthy family of coffee producers, Santos Dumont dedicated himself to aeronautical study and experimentation in Paris, France, where he spent most of his adult life. Alberto Santos Dumont flying the Demoiselle (1909) (public domain image). Santos-Dumont described himself as the first “sportsman of the air.” He started flying by hiring an experienced balloon pilot and took his first balloon rides as a passenger. He quickly moved on to piloting balloons himself, and shortly thereafter to designing his own balloons. In 1898, Santos-Dumont flew his first balloon design, the Brésil. […] his primary interest soon turned to heavier-than-air aircraft. By 1905 he had finished his first fixed-wing aircraft design, and also a helicopter. He finally achieved his dream of flying an aircraft on October 23, 1906 by piloting the 14-bis before a large crowd of witnesses for a distance of 60 metres (197 ft) at a height of about five meters or less (15 ft). This well-documented event was the first flight verified by the Aéro-Club de France of a powered heavier-than-air machine in Europe and won the Deutsch-Archdeacon Price for the first officially observed flight further than 25 meters. On November 12, 1906, Santos-Dumont set the first world record recognized by the Federation Aeronautique Internationale by flying 220 metres in 21.5 seconds. The Wrights used a launching rail for their 1903 flights and a launch catapult for their 1904 and 1905 machines, while the aircraft of Santos-Dumont and other Europeans had wheeled undercarriages. The Wright Brothers continued to use skids, which necessitated the use of a dolly running on a track. The Fédération Aéronautique Internationale, founded in France in 1905 to verify aviation records, stated among its rules that an aircraft should be able to take off under its own power in order to qualify for a record. Supporters of Santos-Dumont maintain that this means the 14-bis was, technically, the first successful fixed-wing aircraft. The wristwatch had already been invented by Patek Philippe, decades earlier, but Santos-Dumont played an important role in popularizing its use by men in the early 20th century. Before him they were generally worn only by women (as jewels), as men favoured pocket watches. Clément Ader […] was a French inventor and engineer born in Muret, Haute Garonne, and is remembered primarily for his pioneering work in aviation. Ader was an innovator in a number of electrical and mechanical engineering fields. He originally studied electrical engineering, and in 1878 improved on the telephone invented by Alexander Graham Bell. After this he established the telephone network in Paris in 1880. In 1881, he invented the “théâtrophone”, a system of telephonic transmission where listeners received a separate channel for each ear, enabling stereophonic perception of the actors on a set; it was this invention which gave the first stereo transmission of opera performances, over a distance of 2 miles (3 km) in 1881. In 1903, he devised a V8 engine for the Paris-Madrid race, but although three or four were produced, none were sold. Following this, he turned to the problem of mechanical flight and until the end of his life gave much time and money to this. Using the studies of Louis Pierre Mouillard (1834–1897) on the flight of birds, he constructed his first flying machine in 1886, the Éole. It was a bat-like design run by a lightweight steam engine of his own invention, with 4 cylinders developing 20 horsepower (15 kW), driving a four-blade propeller. The engine weighed no more than 4 kg/kW (7 pounds per horsepower). The wings had a span of 14 metres and were equipped with a system of warping. All-up weight was 300 kg (650 pounds). On 9 October 1890, Ader attempted a flight of the Éole. It is accepted that the aircraft took off, reaching a height of 20 cm, and flew uncontrolled for approximately 50 m (160 ft), 13 years before the Wright Brothers. Ader undertook the construction of a second aircraft he called the Avion II, also referred to as the Zephyr or Éole II. Most sources agree that work on this aircraft was never completed, and it was abandoned in favour of the Avion III. Ader’s later claim that he flew the Avion II in August 1892 for a distance of 100 metres in Satory near Paris, was never widely accepted. […] In 1909 he published L’Aviation Militaire, a very popular book which went through 10 editions in the five years before the First World War. It is notable for its vision of air warfare and its foreseeing the form of the modern aircraft carrier, with a flat flight deck, an island superstructure, deck elevators and a hangar bay. His idea for an aircraft carrier was relayed by the US Naval Attaché in Paris and were followed by the first trials in the United States in November 1910. An airplane-carrying vessel is indispensable. These vessels will be constructed on a plan very different from what is currently used. First of all the deck will be cleared of all obstacles. It will be flat, as wide as possible without jeopardizing the nautical lines of the hull, and it will look like a landing field. En 1910, il est apprenti mécanicien. Il s’engage à 18 ans, dès le début de la Grande Guerre dans l’artillerie et combat à Verdun. Il est blessé 3 ans plus tard et reçoit la médaille militaire. Une fois guéri, il demande son transfert dans l’aviation et rejoint Dijon puis Chartres. Lâché seul après moins de deux heures de vol en double commande, il est breveté pilote militaire en 1918, à l’âge de vingt-deux ans, et il poursuit sa formation à l’École de chasse et d’acrobatie de Pau après un court passage à Avord. À la fin de la guerre, il est ouvrier chez Renault, mais Émile Dewoitine le remarque dans un meeting aérien. Le 1er juin 1923, Doret entre comme pilote d’essai dans ses usines à Toulouse, et devient rapidement chef pilote d’essai. Jusqu’en 1939, il met au point quarante-trois prototypes d’appareils très différents, ce qui lui donne une maîtrise presque totale du pilotage. Avec la production des appareils de ligne, comme le D.332 Émeraude, il est amené à les convoyer dans des pays de plus en plus lointains et devient un des premiers pilotes de ligne. Roland Garros (public domain image). […] He started his aviation career in 1909 flying Alberto Santos-Dumont’s Demoiselle monoplane, an aircraft that only flew well with a small lightweight pilot. 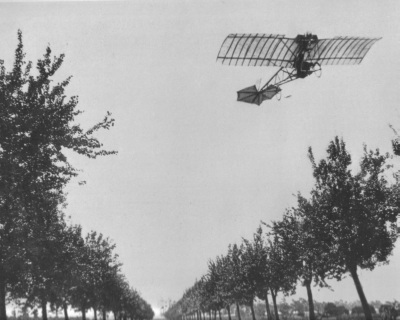 In 1911 Garros graduated to flying Bleriot monoplanes and entered a number of European air races with this type of machine, such as the 1911 Paris to Madrid air race. In the early stages of the air war in World War I the problem of mounting a forward-firing machine gun on combat aircraft was considered by a number of individuals. The so-called interrupter gear did not come into use until Anthony Fokker developed a synchronization device which had a large impact on air combat; however, Garros also had a significant role in the process of achieving this goal. As a reconnaissance pilot with the Escadrille MS26, Garros visited the Morane-Saulnier Works in December 1914. Saulnier’s work on metal deflector wedges attached to propeller blades was taken forward by Garros; he eventually had a workable installation fitted to his Morane-Saulnier Type L aircraft. Garros achieved the first ever shooting-down of an aircraft by a fighter firing through a tractor propeller, on 1 April 1915; two more victories over German aircraft were achieved on 15 and 18 April 1915. On 18 April 1915, either Garros’ fuel line clogged or, by other accounts, his aircraft was downed by ground fire, and he glided to a landing on the German side of the lines. Garros failed to destroy his aircraft before being taken prisoner: most significantly, the gun and armoured propeller remained intact. Legend has it that after examining the plane, German aircraft engineers, led by Fokker, designed the improved interrupter gear system. In fact the work on Fokker’s system had been going for at least six months before Garros’ aircraft fell into their hands. With the advent of the interrupter gear the tables were turned on the Allies, with Fokker’s planes shooting down many Allied aircraft, leading to what became known as the Fokker Scourge. […] was a fighter squadron, later regiment (of three squadrons) of the French Air Force. It served on the Eastern Front of the European Theatre of World War II with the 1st Air Army. The regiment is notable for being one of only two air combat units from an Allied western European country to participate on the Eastern Front during World War II, the other being the British No. 151 Wing RAF, and the only one to fight together with the Soviets until the end of the war in Europe. […] It fought in three campaigns on behalf of the Soviet Union between 22 March 1943, and 9 May 1945, during which time it destroyed 273 enemy aircraft and received numerous orders, citations and decorations from both France and the Soviet Union, including the French Légion d’Honneur and the Soviet Order of the Red Banner. Joseph Stalin awarded the unit the name Niemen for its participation in the Battle of the Niemen River (1944). Georges Guynemer 1917 (public domain image). He was originally rejected for military service, but was accepted for training as a mechanic in late 1914. With determination, he gained acceptance to pilot training, joining Escadrille MS.3 on 8 June 1915. He remained in the same unit for his entire service. He experienced both victory and defeat in the first plane allocated to him, a Morane-Saulnier L monoplane previously flown by Charles Bonnard, and accordingly named Vieux Charles (Old Charles). Guynemer kept the name and continued to use it for most of his later aircraft. […] Flying the more effective plane, Guynemer quickly established himself as one of France’s premier fighter pilots. He became an ace by his fifth victory in February 1916, and was promoted to lieutenant in March. At the year’s end, his score had risen to 25. Capitaine Brocard, commander of Escadrille N.3 (Storks), described Guynemer at that time as “…my most brilliant Stork.” Less than a year later, Guynemer was promoted to captain and commander of the Storks squadron. Guynemer sighted five machines of the Albatros type D-3. Without hesitation, he bore down on them. At that moment enemy patrolling machines, soaring at a great height, appeared suddenly and fell upon Guynemer. There were forty enemy machines in the air at this time, including Baron von Richthofen and his circus division of machines, painted in diagonal blue and white stripes. Toward Guynemer’s right some Belgian machines hove in sight, but it was too late. Guynemer must have been hit. His machine dropped gently toward the earth, and I lost track of it. All that I can say is that the machine was not on fire. Fonck returned to civilian life after World War I, and published his war memoirs Mes Combats, prefaced by Marechal Foch, in 1920. […] He was a pioneer of French aviation in the Andes, the South Atlantic and the North Atlantic. He contributed to the opening up of numerous new routes and is regarded by some as the best pilot of his age. “Je n’en ai pas connu de plus grand” (I’ve never known a greater one), said Didier Daurat, owner of Aéropostale. Guillaumet carried the mail between Argentina and Chile. On Friday 13 June 1930, while crossing the Andes for the 92nd time, he crashed his Potez 25 at Laguna del Diamante in Mendoza, Argentina, because of bad weather. He walked for a week over three mountain passes. Though tempted to give up, he persisted while thinking of his wife, Noëlle, until June 19 at dawn when he was rescued by a 14-year-old boy named Juan García. He reached a village whose inhabitants could not believe his story. This exploit made him stand out among the ‘stars’ of Aéropostale. To his friend Antoine de Saint-Exupéry, who had come to find him, he said, “Ce que j’ai fait, je te le jure, aucune bête ne l’aurait fait.” (What I have done, I swear to you, no other animal would have done.) Saint-Exupéry tells the adventure of Guillaumet in his 1939 book Terre des Hommes (published in English as Wind, Sand and Stars). […] French aristocrat, writer, poet, and pioneering aviator. He became a laureate of several of France’s highest literary awards and also won the U.S. National Book Award. He is best remembered for his novella The Little Prince (Le Petit Prince) and for his lyrical aviation writings, including Wind, Sand and Stars and Night Flight. Saint-Exupéry was a successful commercial pilot before World War II, working airmail routes in Europe, Africa and South America. At the outbreak of war, he joined the Armée de l’Air (French Air Force), flying reconnaissance missions until France’s armistice with Germany in 1940. After being demobilized from the French Air Force, he traveled to the United States to convince its government to enter the war against Nazi Germany quickly. Following a 27-month hiatus in North America, during which he wrote three of his most important works, he joined the Free French Air Force in North Africa, although he was far past the maximum age for such pilots and in declining health. He disappeared over the Mediterranean on his last assigned reconnaissance mission in July 1944, and is believed to have died at that time. Jean Dabry […] est un pilote français de l’Aéropostale puis d’Air France. D’abord officier au long cours, il entre à l’Aéropostale dès 1928 comme navigateur. Deux ans plus tard avec Jean Mermoz comme pilote et Léopold Gimié à la radio, il participe au record de distance en circuit fermé sur Latécoère 28. Les 12 et 13 mai 1930, le même équipage effectue la première traversée postale de l’Atlantique Sud sur l’hydravion Laté 28 “Comte de la Vaulx”. […] fut l’un des plus célèbres ingénieurs de l’histoire de l’aviation française. Diplômé des Arts et Métiers, Servanty débuta en 1931 chez Breguet, puis entra en 1937 à la SNCASO lors de la création de celle-ci. Pendant la Seconde Guerre mondiale, Servanty continua son activité sous le contrôle des autorités d’occupation mais réalisa aussi en secret l’étude du SO.6000 Triton, le premier avion à réaction français, qui effectua son premier vol en novembre 1946. Par la suite, Servanty dirigea les études de plusieurs avions militaires d’importance tels que le SO.6020 Espadon et le SO.9000 Trident, prototype très innovateur d’un intercepteur à propulsion mixte turboréacteur-fusée. C’est toutefois grâce à une œuvre à vocation civile que Servanty acquit sa notoriété : la direction technique du programme Concorde pour la partie française. L’amitié nouée entre Servanty et son homologue anglais Bill Strang permit en particulier au projet de surmonter les nombreuses difficultés d’une collaboration franco-britannique pas toujours évidente au niveau politique. Bourrieau eut l’honneur d’être le premier à faire voler le Fouga « Sylphe ” modèle probatoire, le 14 juillet 1949. Il mit au point cet appareil ainsi que les bancs volants Fouga « Gémeaux ” pour le réacteur Turbomeca. Finalement, le 23 juillet 1952, il y a trente-cinq ans, il décolla le prototype du « Magister “, dessiné par Robert Castello et Mauboussin (d’ou l’appellation C.M. 170), consacré par 871 exemplaires dont beaucoup volent toujours! Léon Bourrieau fut d’abord militaire. La finesse de son pilotage lui valut d’appartenir à la « Patrouille acrobatique d’Etampes ” et d’assumer les responsabilités de moniteur. Le 30 Janvier 1959, le Br-1150 Atlantic motorisé par des turbopropulseurs Rolls-Royce Tyne fut sélectionné par l’OTAN parmi 21 projets. Le 2 Octobre 1961, la SECBAT (Société Européenne pour la Construction du Breguet Atlantic) fut crée. SABCA, Fairey & Fabrique Nationale Herstal (Belgique). Les turbopropulseurs Tyne étaient fournis par Rolls-Royce, SNECMA-Hispano, FN et MTU; les équipements électroniques par des sociétés Américaines. Les chaînes de production ont été installées dans les usines Breguet de Toulouse. Quatre prototypes furent construits. Le premier effectua son vol initial le 21 Octobre 1961 avec Bernard Witt, Roméo Zinzoni et René Périneau aux commandes. Le second vola le 23 Février 1962, piloté par Yves Brunaud, M. Raymond et René Périneau. Franz Josef Strauss […] was a German politician. He was the chairman of the Christian Social Union, member of the federal cabinet in different positions and long-time minister-president of the state of Bavaria. As an aerospace enthusiast, Strauss was one of the driving persons to create Airbus in the 1970s. He served as Chairman of Airbus in the late 1980s, until his death in 1988 […]. Munich’s new airport, the Franz Josef Strauss Airport, was named after him in 1992. This list is far from covering all pioneers, nor all the great engineers that built French aviation during the past century. This is just a random walk through Blagnac streets. While looking for these characters I stumbled upon a great site with a good collection of French aviation characters: “L’Aviation Française: des Hommes et des Ailes“. PD2: Emphasis are mine. Most of the excerpts come from Wikipedia articles.